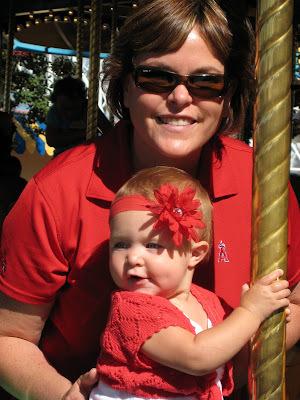 It has become tradition in our family that after the afternoon Angels games that we all head over to Disneyland. 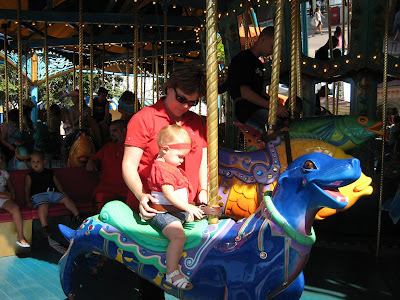 This week we went over to Californiaventures, and spent a little time there. 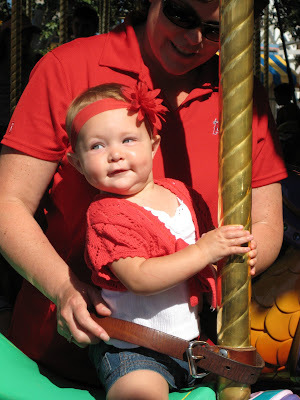 Grammy took Kamryn on the carousel they have there. It was very cute and all the animals were sea creatures. 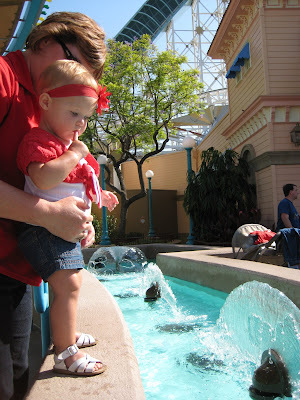 Kamryn got cozy on a sea lion, and had a blast sitting there "dancing" on it, with Grammy by her side. Grammy and Kami waiting for the ride to start. Kamryn is such a goofball! She is certainly full of personality, and we love it! She had a grand ol' time sitting on the sealion, until it started to move. 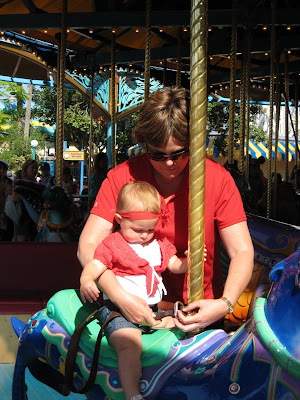 That made her a little nervous, and she insisted that Grammy hold her for the remainder of the ride. 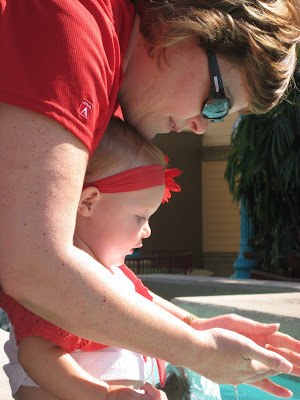 After the ride, Grammy took Kam over to splash around a little bit in the water, which she LOVED! It was certainly warm enough to warrant a little time by the water, and was also a nice activity to do while we waited for the older kids to get off their rides. 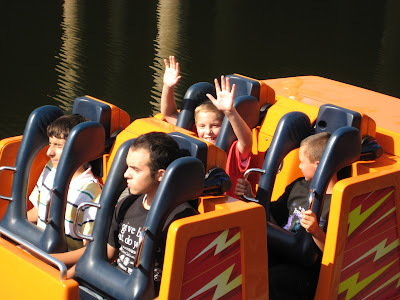 There's Matt with his arms up ready for the roller coaster. Dad saw him talking to the kid next to him in line, and wasn't surprised that they ended up sitting next to each other. Matt makes friends everywhere he goes! Like Dad would say of Spongebob, Matt is just a "happy soul." 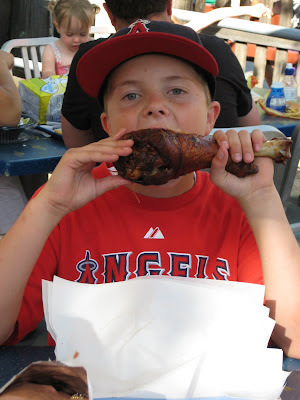 Here's Matt with his sought after turkey leg. He did a pretty good job finishing it off, too! It was a wonderful, relaxing day, and we're looking forward to many more just like it! Kirk and Jennifer (aka Mom and Dad) married in January 1986. They have 5 children; Kelsey (married to Jason, and mom to Kamryn), Tracey (currently attending BYU-I), Evan (the family's newest high school graduate), Makenna (the family's newest high schooler), and Matthew (the family's newest middle schooler).